PMAT helped secure eight amendments to the Land Use Planning Approvals Amendment (Tasmanian Planning Policies and Miscellaneous Amendments) Bill 2018. This passed with tri-partisan support in the Tasmanian Parliament in November 2018. PMAT met with Labor, the Greens and briefed the Legislative Council on the amendments, which enhance accountability and transparency by increasing the role of Parliament, the Tasmanian Planning Commission and the community in the development of Tasmanian Planning Policies. Strategic statewide policies have been a missing component of the Resource Management and Planning System for a very long time, and though PMAT’s preference is for the development of State Policies as they provide for a whole of Government approach, (as opposed to Tasmanian Planning Policies, which have limited scope), we welcomed efforts to develop strategic policies. Read PMAT’s Media Release here. Submissions have been invited on the principles of how Tasmania’s Local Government should be legally established and elected; how it should provide services to its community; and how it should be accountable to the community. The Review’s Terms of Reference and governance structure is available here. Submissions close on 1 March 2019. Sophie Underwood, coordinator of Planning Matters Alliance Tasmania, gave this presentation to a full-day seminar on 22 October 2018 at the Hobart Function and Conference Centre. The seminar was organised by the Tasmanian Division of the Environment Institute of Australia and New Zealand. The overwhelming majority of Tasmanian local council candidates who took part in a planning survey believe councils should have greater capacity to protect local character and amenity and places important to local communities. With Tasmania booming, tourism numbers on the rise, population growth in Hobart accelerating and net migration losses falling the Planning Institute Australia made its Tasmania 2018 conference all about these important issues. 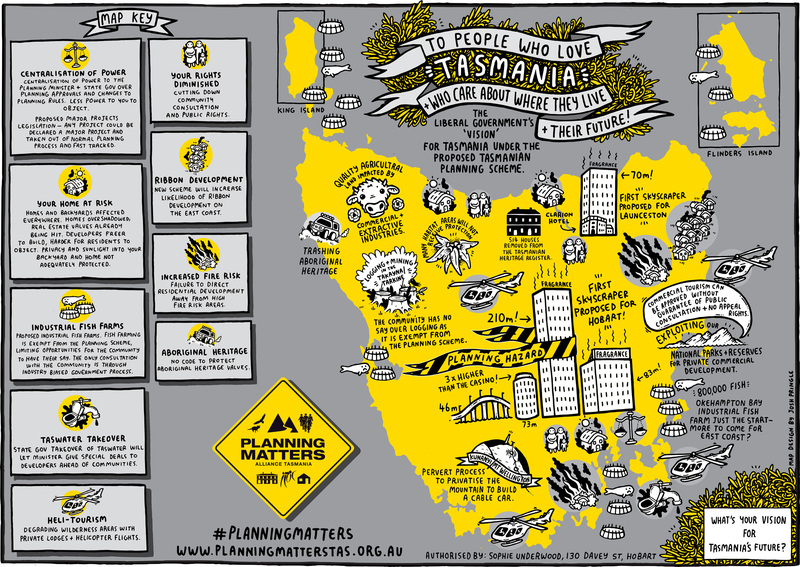 The Planning Matters Alliance Tasmania has released its Planning Policy Election Scorecard, ranking the three main political parties against ten criteria. A Mount Wellington Cable Car Company public meeting for ‘South Hobart residents only’ has been suddenly cancelled despite significant local resident interest and the imminent closure of public consultation on the Hodgman Government’s proposed Major Projects legislation. Much-loved Tasmanian and international actor Essie Davis helped launch the Planning Matters Alliance in July 2017 at the beautiful Brooke Street Larder on Hobart’s waterfront. Forty-six community groups encompassing a wide cross section of interests will formally launch an alliance that will take a positive agenda for planning scheme reform to the next state election, and seek to reverse the weakened and undemocratic regulations being introduced by the Hodgman Government.